The seagulls have their own ice skating rink at present. 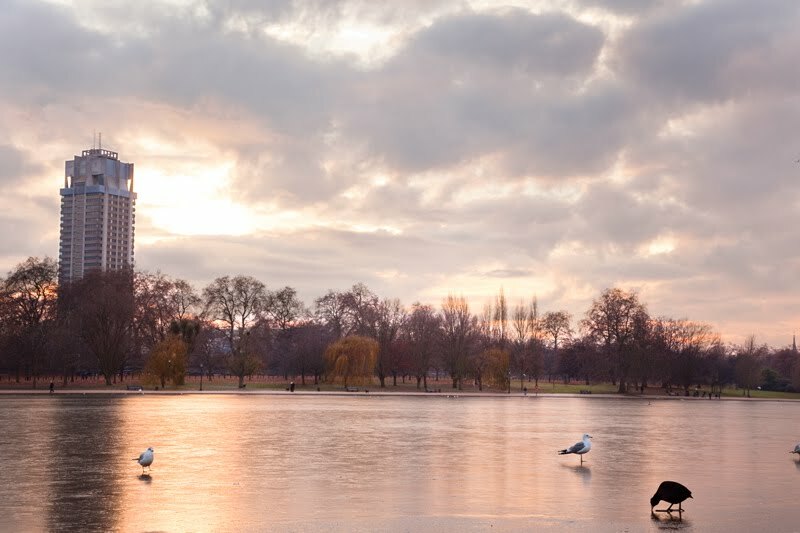 The serpentine in Hyde Park is frozen. Hundreds of crabby looking geese have left the lake and are sitting in small bad tempered gangs on the fields. I suspect that part of their disposition has to do with the seagulls failing about with laughter at their now exceptionally ungainly attempts at landing on the slippery surface. Your blog is reminding me so much of my time in London in 1981 - I remember the Serpentime freezing then too. It was magical for me! Heard you got even more cold and snow last night. Hope you're staying warm. Love the idea of the seagulls laughing at the geese. The Serpentine is one of my favorites. But I have never seen it frozen before. Those seagulls are so wicked, aren't they! LOL!! Nice shot! I imagine that seagulls slipping about would be funny! I hope it thaws out a bit for you guys soon though, you're not used to the cold! The interaction between geese and pigeons is a fascinating idea. This is just such a gorgeous picture. Fabulous!